The battery has three cells and outputs 11.1V storing 1500mAh of charge. Because this is a triple cell battery pack, a special charger is needed. This battery is not compatible with single cell chargers. A compatible charger is listed below. Hi, any chance of knowing when these are coming back in stock? Will this run an Arduino Uno, EL Escudo 12v AC inverter and 8 (3m long) EL wires? With all of the variables, I'm having trouble deciding. How long might it last, also. Minutes, hours, days? Is there a connector you recommend for the 14AWG bare discharge leads? I assume I could just attach male headers to my perf board, but that wouldn't offer any polarity protection and I assume there's a more elegant solution? I've been collecting various sizes of LiPo batteries and have collected mini-JST connectors for the 1S ones, regular JST connectors for the 2S ones, an XT60 connector for the 4S ones, but I'm not sure what connector I should get for these 3S ones. 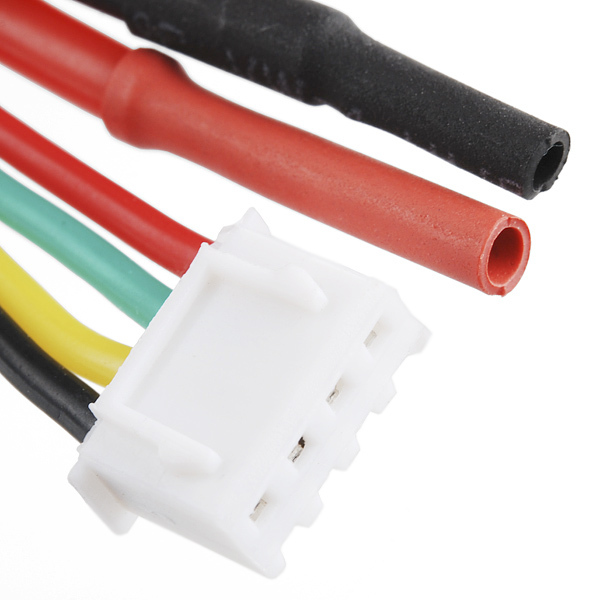 I used to use Radio Shack "molex" type connectors (labeled "9.6V" but really, run what you want,) and they work, but they are a bit bulky, and there is a small risk of connecting them with inverse polarity. These are readily available and easy to work with, so you might want to consider those. I have since switched over entirely to "Deans" style T-connectors. They are rated for 50A, and are impossible to connect with inverse polarity. Typically, they are made from a nylon housing, and the connector blades grip very well without additional retainers. Another popular connector in this class is XT-60, which you can find here on SparkFun, and in many hobby stores on- and off-line. It's also important to run as short cables as you can, and use low-gauge stranded cables when running any longer runs. A 4" run could probably be done with 20ga solid cable, but a 1ft run should be 16ga twisted to avoid unnecessary voltage drop and heat buildup. What is the maximum current draw on this battery? Also, what is 20C continuous discharge rate? Thank you in advance to anyone who knows the answers. My understanding is that 20C means the battery can continuously discharge at a rate of 20 times its capacity. 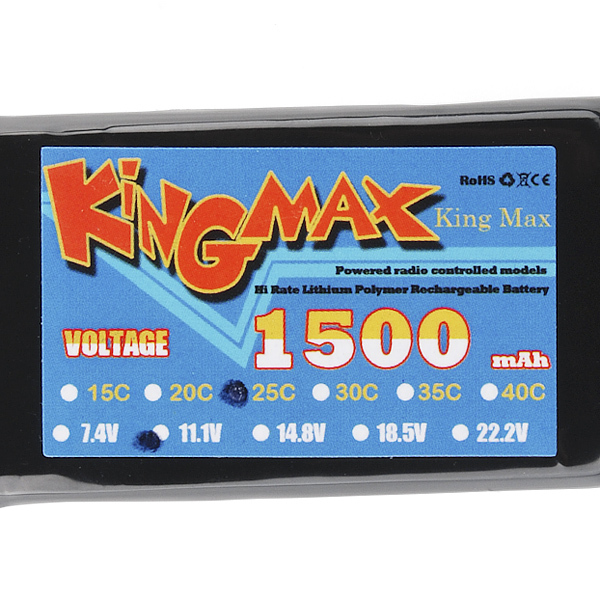 Since this is a 1500mAh battery, that means it could discharge at up to 30amps (20 x 1500mA). The enormous discharge rate of LiPo batteries is what I think makes them so compelling compared to other portable batteries. e.g. Sparkfun sells the 7.4v 500mAh Lipo for $4.95, which is about the cost of a 9v disposable alkaline battery, which has about the same capacity (~500mAh). The LiPo battery is physically slightly smaller and of course is rechargeable, but I think the best aspect is that it is 25C, which means it can discharge at 12.5A! I believe the alkaline 9V is closer to 1C, and is designed to be discharged at about 15mA according to battery websites. There is no protection circuitry. If you run these batteries down they are gone. I accidentally left this one on again, running a wifi router. Now the 'outer' two cells show 2v each, the 'middle' cell shows 0v. Ouch. This happened once before, this time I bought two batteries. Looks like I need some sort of cut-out circuit. What are the charger settings for the Imax charger? I just got one of these to build the awesome horn prank.... I'm charging it right now (and you do need to hook up the large leads with the Imax charger) at .5 amps just to be safe... but should I be using a higher setting? 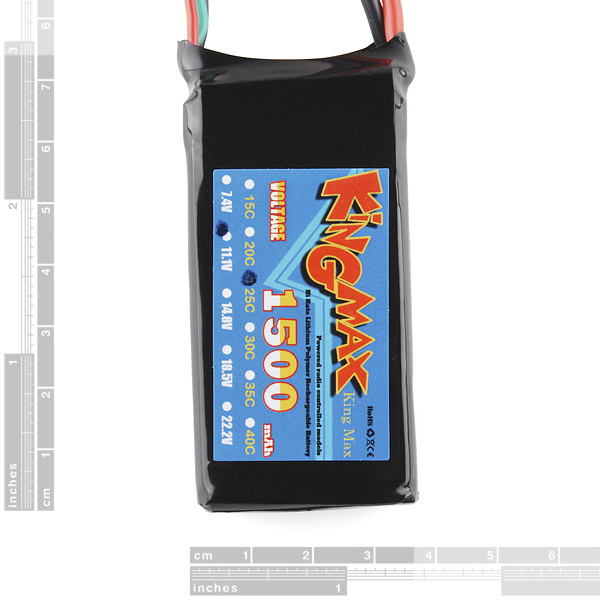 I have read that you can safely charge a LiPo at a maximum rate of 1C, so if you have a 1500 mAH battery, then you should not exceed 1.5A if charge current. The maximum charge voltage per cell, I have read, is 4.2V. As always, if the battery gets hot while charging, stop the charging process, as it means something is wrong. Just wondering how stable the 11.1V is. I'm considering using this to power your 12V EL wire power inverter for my costume for Halloween. I'm a little weary tho, because the inverter data sheet says 11V min. So I'm wondering if it would be safe trying to power it and say 50 ft of wire. 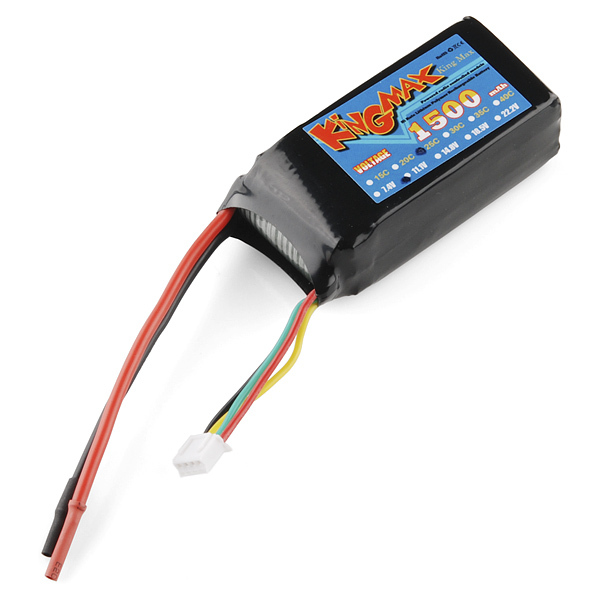 Hi I fly rc planes and use a lot of these type batteries, there fully charged voltage is 12.6 and the c20 rating means you can pull 20x 1.5 amps or 30 amps from one pack like this as far as being safe you should read up on lipo batteries before you ever use or try rechanging one there are certain inherent dangers in the use of these type batteries like bursting into flames and shooting fire out of them at a radius of approx 5 feet so use with great care. Can I recharge this battery with a solar panel while it is being used? All of our cells have a protection circuit. I recently bought one of these cells and they do not have protection circuitry. Can you give some specs on the circuit? Please confirm this. I recently ran one of these packs down to five volts, and while i managed to recover it, at no point did it act like it had any kind of protection circuit. I ran it down but was not able to recover it. Looks like I may have done that again. what is the four pin connector for? The 4-pin JST-XH connector is for charging. It allows the charger to drive each cell individually. The two large leads are for connecting the load - they are not used during charging. Actually many chargers will charge through the main "discharge plug as well" and only balance through the 4 pin connector. The main connector has all the cells wired in series and can carry the full discharge rate, the smaller multi-pin plug has pairs wired to each cell, so that you can monitor each cell voltage independently while charging. This is also used by the charger to draw down a cell that is slightly higher in voltage while charging so that it will end up balanced across the pack. I just got the recommended charger (https://www.sparkfun.com/products/10473), and it requires connection to the "discharge" connector even when balancing. I might hook up an ammeter to determine if the main charge current is flowing through that. Might be it just bypasses at the JST connector to maintain balance.